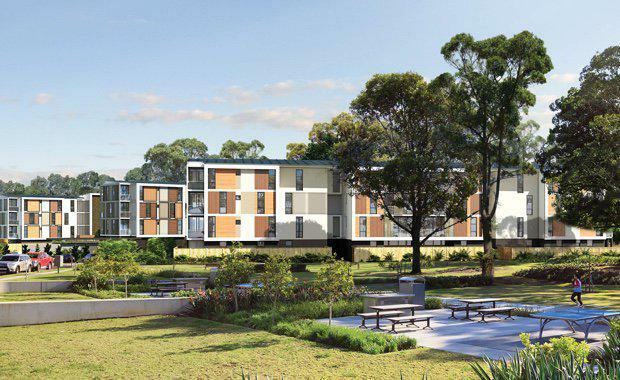 Developer JSN Hanna has launched a 124-apartment residential development at Potts Hill, approximately 20km from the Sydney CBD and 15km from Parramatta. The Tallowood project will be set over five buildings in a campus-style environment with central gardens, at 17 Hanna Street, Potts Hill. Prices will range from $579,000 - $705,000 for two bedroom apartments and $715,000 - $885,000 for three bedroom apartments. Features will include floor to ceiling glass doors, Stone benchtops, ASKO Cooking appliances with 5 year warranty and air conditioning. Many apartments feature bushland and or district views, with a select number offering up to 150sqm of designated outdoor terrace and garden space in addition to internal space. Developed and constructed by JSN Hanna, a 50-year-old 3rd generation family company, and designed by the Integrated Design Group, the development is located close to the expansive Sydney Water reservoir site in Potts Hill, and benefits from the surrounding natural bushland and purpose-built parks, bike and walking paths and children’s play areas. Tallowood is approximately 800 metres to Birrong Train Station, and one stop from Bankstown train station. An express train to the CBD can be boarded two stops away, at Lidcombe train station. JLL Manager, Residential Project Marketing – NSW, Ed Tancred, said, “This development really has a great deal to offer residents. Key attractions are likely to be the generous outdoor spaces that many of the apartments feature and the surrounding natural bushland, the views of which are unlikely to ever be built out due to their association with the reservoir. The location offers a variety of parks and leisure spaces, transport and retail options and a number of educational facilities. “The apartments will suit families, professionals or older residents who may be wishing to downsize while maintaining a sense of peace and quiet in their surrounds. The price ranges will also cater to a number of different buyer groups,” Mr Tancred said. Potts Hill has been identified as a master planned community. Parcels of land surrounding the Sydney Water reservoir were sold by Landcom, now UrbanGrowth NSW, approximately five years ago which has allowed for residential developments to take place. Potts Hill’s proximity to Bankstown will see it benefit from the growth and expansion generated by infrastructure developments in the area, such as the North West Rail Link from Chatswood to Bankstown. “Tallowood is the culmination of generations of experience, weaving together the latest technologies and the most durable building products, with a meticulous attention to detail,” said JSN Hanna Managing Director, Edward Hanna. “Tallowood”, set amongst the majestic tree after which it has been named, is JSN Hanna’s second successful development at Potts Hill, following on from the striking 'Aspect Apartments'. These residences were designed for those longing for a Tree Change, but wanting to stay close to family, friends, work and transport,” said Mr Hanna.